As I lean over the row of marigolds just beginning to bloom, I remember my Dad’s garden. I remember summer days that seemed to go on forever, and the end of that forever when school started with yet a new forever. I recall the garden in its end of summer state, with marigolds blooming along the edge and dahlias and zinnias tied to stakes. I remember tall tomato plants and fresh green beans, bell peppers and cucumbers of all sizes. Seeing a row of scentless zinnias doesn’t evoke these kinds of memories, nor does seeing a dahlia blooming in any garden. 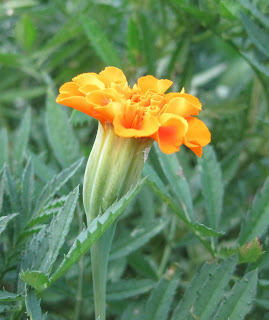 But the marigolds, with their distinctive scent that can only be described as that of a marigold, do. I don’t need scientific studies to tell me why this is, though this phenomenon of scent and memories has been studied by scientists. I just know how it is. I know that scent is the key that unlocks our memories. Even blindfolded, if I smelled a marigold, it would bring back these memories of my Dad's garden once again. So if you want your garden to be memorable to those who visit it, consider the scents of the plants and blooms you include. Then when those who visit your garden leave, they will take with them the key, the scent of a particular flower or plant, that they can use later to unlock their memories of your garden. Scent is the key to unlocking the memories of the garden. I was on a walk, and I suddenly started thinking of my Grandma's garden. It was the smell of the boxwood. I've never thought of it as a fragrant plan until I realized that's the exact smell of my Grandma's. I read on someone's blog where someone talked about a friend who planted thyme in the ground in the space between the walking stones, so that when they stepped on it, you could smell thyme everywhere. The details a bit fuzzy because I read a lot of blogs these days, but hey, even just the mention of a strong scent like thyme made this story memorable! Beautifully written, Carol. The memory of scent is so very strong. It is how I best remember my mother, the smell of her powder and perfume, her bedroom, her clothes. I can smell it right now. And am smiling. Recently on a garden visit I overheard another gardener say that the garden made them appreciate the importance of scent for the first time. I was so floored by the comment that it made me realize that I chose most of my flowers and plants for their scent. My garden is not that interesting visually. Visual design is not my strength. When my sister came to visit we walked around touching, smelling, and tasting plants. I guess I'm more of a tactile designer. It is amazing, the memories a scent can evoke. The scent of iris, takes me right back to my mother's garden. Pine smoke, takes me back to some childhood camping trip, with my dad setting the campfire. What a lovely post and so true..
Lilacs bring back memories of my childhood home and Magnolia's bring back memories of our family reunions in the south.. I totally agree with this wonderful idea to include scented plants that your guest will remember as well"
I will always associate the scent of snapdragons with childhood memories of playing in the greenhouses of my mother's very special foster aunt. I even wrote a blog post about it in April when the snapdragons began blooming this year. You are so right. The scent of wild roses always reminds me of my gandmothers garden! It always brings the same pictures back into my head. I used to think that if one flower had scent, all flowers of that kind had scent. But some lilies have a wonderful fragrance, and some lack fragrance. Ditto roses, peonies & probably lilacs, too. But catalogs don't always mention which do and which don't. This is a beautiful post. I have chosen many plants because of their fragrance, old roses, mock orange, peonies - but it is less romantic scents that unlock memory. It is the scent of privet hedge flowers that make me think of the street where my grandmother lived. And then there is the smell of cowbarns, beautifully described in E.B. White's Charlotte's Web. I loved my uncle's dairy farm in Vermont. As a child, when we went to visit I always swore I could tell when we had crossed the Vermont state line because I could smell the manure. Which was a good thing as far as I was concerned.